Looking to make your football party more interesting? Our football squares app will certainly WOW your guests once a personal copy of a pre-filled football squares grid appears as a message on their phone. Our app is sure to be an instant hit as part of your Super Bowl party game list. Sharing is enabled and encouraged! You enter the names of two teams and between 1 and 100 players. Click the “+” symbol and our app randomly distributes the players on a 100 square grid. If you have 4 players, each player will have 25 squares. Squares will be marked “N/A” if an even distribution cannot amount to 100. Share squares with your guests! Don’t be a square, share your squares! It’s free and easy. This gives your guests a reference point throughout the game. The last digit of each team’s score is used to determine the winning square each quarter. See example below for more details. Format Idea: Instead of only using the score at the end of each quarter, award squares at each commercial break! Let us know if you have questions or ideas on how our app can be improved by entering a comment below. Your feedback inspires us to build the best tools for sports and entertainment! Also have an idea for a pool, not sure if this has been done , but can you do a playoff bracket pool? Would you be able to create a 25 grid squares, we only have 5 players every year and there is not one site that run it. Thanks for the feedback Joe! 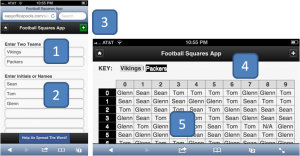 We will add this to our priority list as we consider enhancements for the Football Squares application. It would be perfect if I could enter a name and how many squares they bought. That way I can print out a random version of the squares that have been sold. Then the leftovers would be left blank for people to purchase at the last minute. Hey Kevin – Thanks for the feedback! We will keep that in mind for our next version of the app. looking at this grid format seems to be something I would be interested in doing however, I have a few comments.